Friends University has the No. 1 Master of Education program among private universities in Kansas and is ranked at No. 32 in the nation according to College Choice. Friends is one of only two Kansas institutions on the list. This ranking follows U.S. News & World Report’s announcement, made earlier this year, which ranked Friends University’s Master of Education in the top programs for online learning. Friends University offers two Master of Education degrees, including the Master of Education in Teaching and Learning and the Master of Education in Special Education High Incidence (P-12). Both the Teaching and Learning and the Special Education High Incidence tracks are offered in on-campus and online formats. Started in 1987 (with an online option added in 2010), the Master of Education degree at Friends University focuses on the practical application of effective classroom learning-teaching skills, student advocacy, differentiated instruction and educational leadership. The programs are accredited through the National Council for the Accreditation of Teacher Education (NCATE). Costs for the programs range from $12,168 for the on-campus option to $13,428 for the online option. The programs feature six core classes that students can combine with 12 Friends University Teacher Education Workshops to customize their degree program. To create the rankings, College Choice utilized publicly available sources, including sources from U.S. News & World Report, the National Center for Education Statistics, and college websites. College Choice also calculated an affordability rating by using the average tuition, fees and the mean salary of graduates 10 years after graduation. 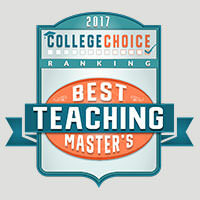 To learn more about the ranking, visit http://www.collegechoice.net/rankings/best-masters-in-teaching-degrees/.